PokerStars created the first tiered VIP Program, Full Tilt Poker gave us the wildly popular Rush Poker tables, and now it’s Party Poker is making sure they’re not left out of the poker innovation category with its addition of Double Holdem. Double Holdem begins in the same way as normal hand of Texas Holdem with the sole exception that you are dealt three hole cards. 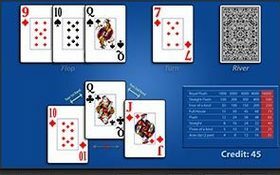 After the flop things get even trickier, as each player must choose one of their hole-cards to use as a “Point Card” that can be used with either one of the two remaining hole-cards to make your best 5-Card Poker hand (these two cards cannot be used together). For instance, if you are dealt QhQdKh and the flop is QcTh4h, you would use the Qh as your “Point Card” since you would have the following two hands: QhKh for a strong flush draw, and QhQd for top-set –if you chose the Qd you would lose out on the flush draw since your hands would be QdKh and QdQh. It will be interesting to see how quickly online poker players take to Double Holdem, and also how strong the game’s staying power is, since most new formats are initially very popular and fade out over time. This entry was posted on Thursday, October 14th, 2010 at 3:32 am and is filed under Poker Industry News. You can follow any responses to this entry through the RSS 2.0 feed. You can leave a response, or trackback from your own site.